The deepest darkest black soaks the body of this disc shaped cupboard knob and presents a single shining golden star atop the varying layers. Slight tonal grains in the black body appear like polished hard wood. Choose a timeless design to complement the elegance of your home furniture. This black resin knob, used on a kitchen cupboard or a dresser, will enhance the charm and tastefulness of your domestic environment. 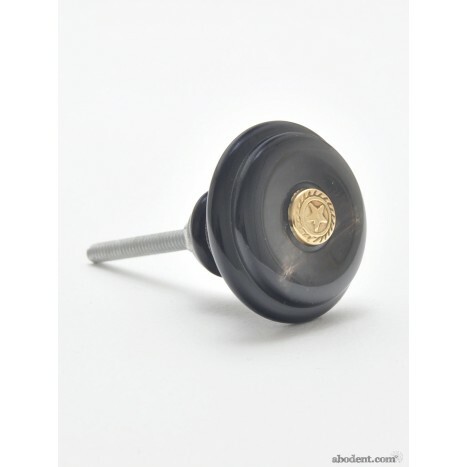 Tags: black and gold cupboard knob, golden star resin knob, black resin dresser pull, black knobs.